With operation up to 200 MHz and its 8 MByte embedded memory, the GP-24200 defines a new level of performance for USB 2.0 PC instruments. Applications: high speed digital stimuli / pattern generation, digital data analysis or fast bi-directional protocol port control. 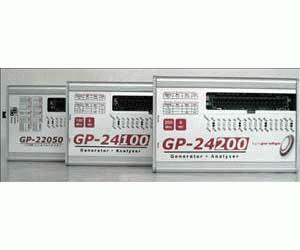 The GP-24200 is delivered with the 8PI Control Panel software for control from the PC, featuring GUI, TCL/tk scripting and C/C++ DLL interfaces on all modes of operation.